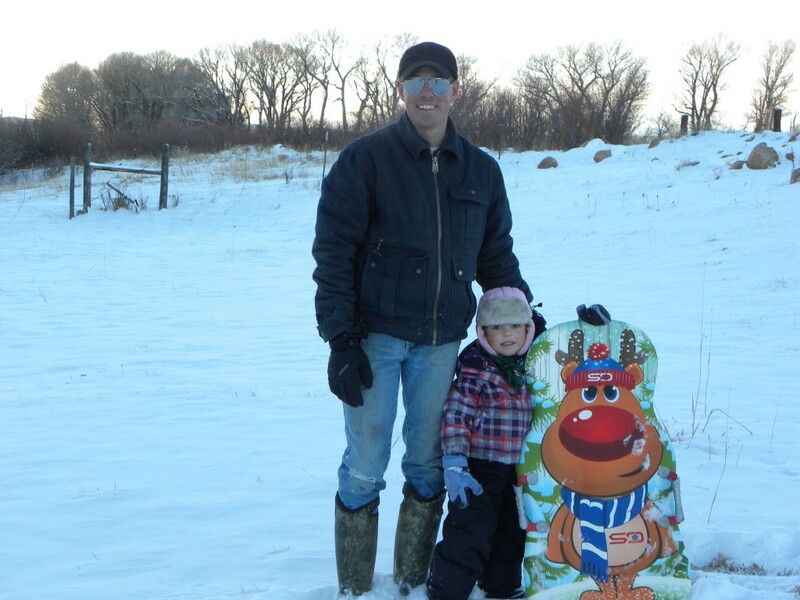 Winter is a beautiful time to visit the ranch! Even though there is a chill in the air, the outdoors is an adventurous, inviting place to be. There is nothing quite like fresh winter air especially when there is so much to do! Your family might be due to spend some time together this winter, so here is a list of 5 things that your kids will remember forever! Go on a horse-drawn wagon ride. Our team of Percherons, Goliath and Decker, put a new meaning to horse-power! Being on a wagon pulled by a team of horses often conjures up nostalgic feelings of what it would be like to live in the “old days” when there were not automobiles. During winter months, bring a blanket to set across everyone’s lap and get ready for a 20-30 minute tour through the Vee Bar meadows. Upon return to the historic main lodge, help yourselves to a cup of free hot chocolate. Visit the goats, mini donkey’s and baby horses. The Vee Bar has its own version of a petting zoo. Two friendly goats, Annie & Pesky, wander the grounds around the barn and corrals. They are always up for a good rub! The mini donkeys also come to the fence to get passers by to dole out some good pets! Bring a sled or borrow one from the Vee Bar. There are not very many hills on the Vee Bar, but our family has managed to find a couple tried and true places. As winter progresses, there are some drifts that are perfect for a short thrill ride. Another hill can be found in one of the horse pastures, and as long as there is some fresh snow, it’s an entertaining and close place to sled. When snow is scarce at the ranch, the mountains beckon. Our family can tell you some of our favorite places to go! It only takes about 15 minutes to drive to any number of great hills! Evening board games, card games, and a soak in the outdoor hot tub. At the day’s end, many families that visit the ranch find themselves absorbed in board games in the John Wayne Saloon. At the Vee Bar, there are not televisions in the cabins, so families are drawn to other forms of entertainment, and quality time together. Maybe you want to battle it out over a Monopoly game, or Apples to Apples, Battleships, a game of pool, or teach your kids how to play a friendly game of poker. When the games are done, take the family for a soak in the outdoor hot tub, and count the stars. 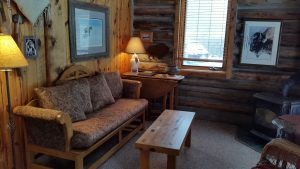 Then retreat to your riverside suite or cabin, heated by a gas fireplace, and bunk down for the night. Campfire with S’mores! Last spring the Vee Bar rebuilt the fire pit in the front lawn at the lodge. With the purchase of a Ranch Escape Package, a campfire and s’mores are part of the package. But, if you are here for only a couple nights, you can still bring your own firewood and s’mores roasting supplies and help yourself to the pit. Of course, there are many, many other things to do during your visit to the Vee Bar Guest Ranch! Downhill skiing and snowshoeing are other popular activities, and many families dine at the Vee Bar at least one night during their stay. Check out our B&B Specials & Packages page for family deals, other ideas, and more information! Spring in Wyoming means an abundance of our famous wind and a few stray snowstorms sprinkled amongst days that are so bright and sunny, we can almost taste it. It also means calving, a season of its own here in Wyoming and at the Vee Bar Ranch. The cows that you will be riding amongst during the summer have been busy doing the most natural thing they will do their whole lives. 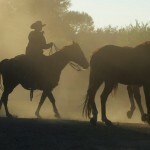 But even on the ranches you will be visiting, there is more than one way to usher in new life. First of all, calve is both a verb and a noun, which can get a little confusing. It describes both the act of giving birth and the actual animal itself. The time of year that the herd calves is picked many months ago, 283 days before the birth day, according to the average. 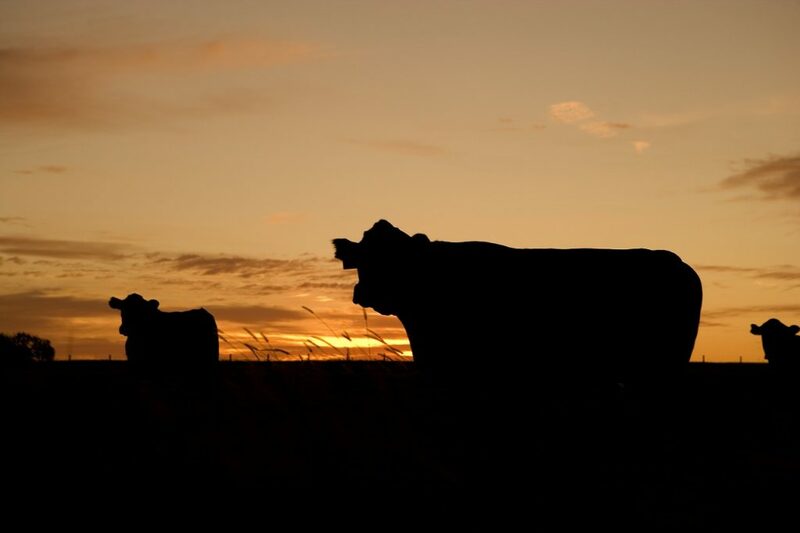 Breeding happens during the summer for 2-3 cycles to increase the chances of conception, or 65-70 days, which means the range of dates for calving runs at least two months. Most ranchers in this area, ourselves included, practice “spring calving” starting as early as January and running into March. This time of the year is preferred by ranchers who want to maximize the size of the calves for selling at the market in the fall. It is also preferred because the ground is hard and frozen, reducing the risk of infections or injuries from “soggy soil.” It is challenging because we get the majority of our snowfall for the year during these months, making it pretty common to be checking cows during a blizzard or storm. And those babies might get a warm shower in the outhouse by the corral (no joke!) or towels and a sheltered barn, at the very least. Animal husbandry has some unusual twists! Two to four times a day (and even more for first-time mothers, called heifers) the herd is checked around the clock. 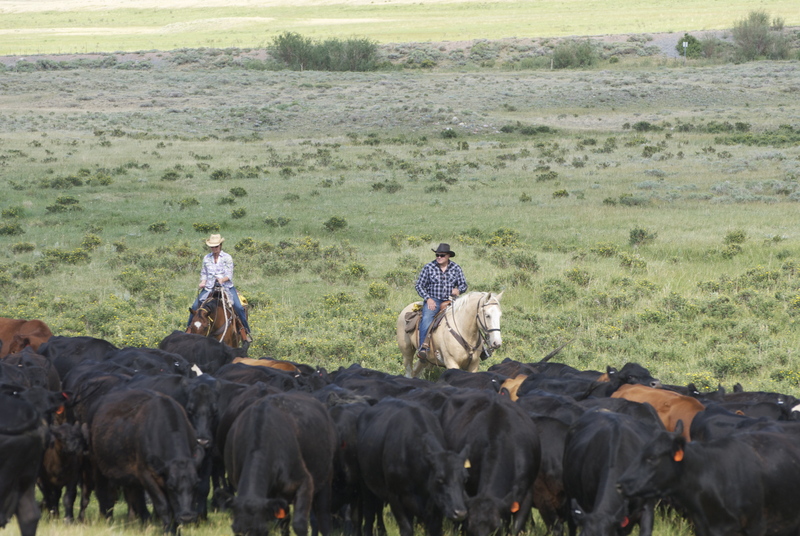 Some ranches hire someone to do it, usually ranch kids from the university in Laramie. Sometimes it’s an all-night card game and a bottle of whiskey, or other traditions kept by the generations of cowboys and ranchers that have come before. In Wyoming, it’s a rite of passage, as well as being a yearly practice. Here at the Vee Bar, it’s more often comprised of games of Uno and alarm clocks off and on all night, left in the hands of Brent and other friends and family members who come stay to help out. The calvers (it’s also a noun to describe the hands that monitor the process) usually stay in the “camper,” or the living quarters of the horse trailer here on the ranch. You might find Brent out there or his friend, Kelly, who brings along his 6-year old son. It won’t be long before Bailey will be up every few hours, checking cows with her dad. We have calved about 60 little ones this season, no small feat. At our neighboring ranch, they do things differently. 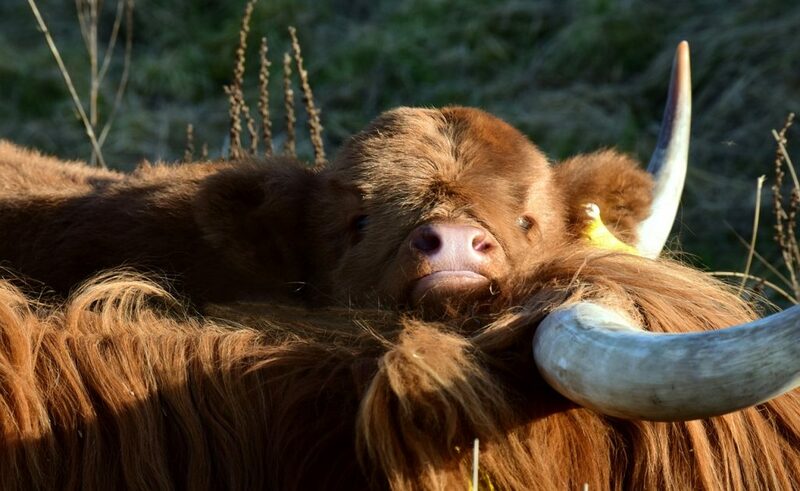 Hecht Creek Ranch practices “summer calving” with their heard of hairy Highland cattle. In their case, there is very little night calving, because temperatures are not sub-zero. 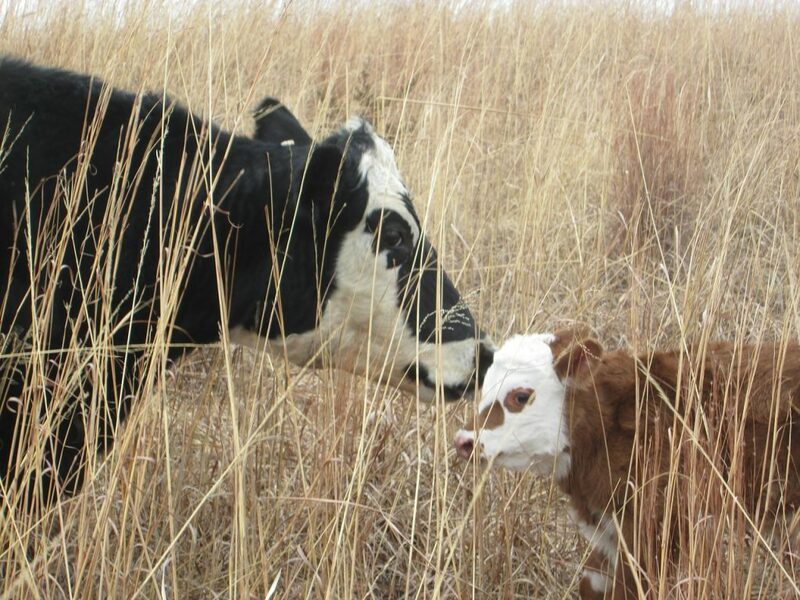 And while their calves may be smaller at market time in the fall, they traditionally have less death loss and save money in hay costs, taking advantage of the peak grasses for moms to nurse the babies to a heavy weight. Either way you slice it, you may have to pull the calves that are having troubles being born or help the mamas or the calves along in the process. Some folks even bring the cows in the barn to calve. And then you need to determine if the calves and mamas are healthy, if the calves are nursing, and other surprises along the way that are familiar to new parents. Soon, these snowstorms and long hours helping our herd bring in the new generation will feel like a long time ago. We will watch the river rise with the melting snow in the mountains, the grass get greener, and wildflowers and birds starting to make their appearances. By the time you see them, the calves will be kicking up their heels and playing in the new green pastures. And so will we. Did you know? 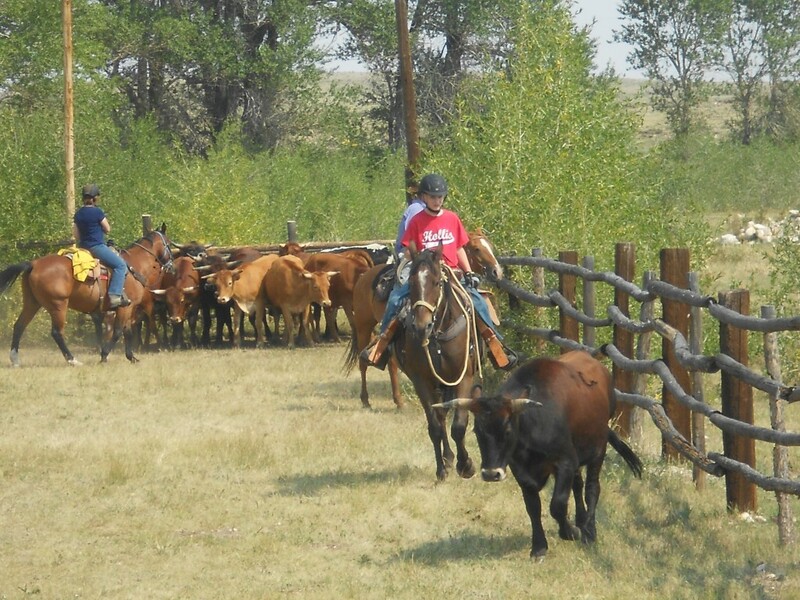 You can visit the Vee Bar Guest Ranch in the summer and help herd cattle or team pen cattle! Read more about our summer packages and rates, view our sample summer schedule, and contact us to plan your visit! If the walls of the lodge could tell a story, that story would include a cross-section of travelers, many of whom were at the Vee Bar celebrating a momentous occasion. Some of the most memorable events at the ranch include graduation parties, birthday parties, retirement dinners, celebrations of life, family reunions, weddings, anniversary parties (which can be much like a wedding! ), and much more. Many guests at the Vee Bar find themselves at the ranch to celebrate reaching a milestone, and others want to treat some special guests to a nice weekend or dinner getaway where they can experience true western Wyoming hospitality. Here at the Vee Bar, we love to host events! We enjoy helping to plan a memorable, nice yet rustic event that your guests will remember with fondness. There is no such thing as a cookie-cutter template that we use to plan your event. Instead, we work with you to create a menu, schedule of activities, and ambiance that is as unique as the event itself! Maybe you would like to rent the ranch for half a day to play horseshoes, corn hole, volleyball, rope the dummy-calf, take a horse-drawn wagon ride, enjoy some appetizers, or make it a lunch or dinner! Do you want a casual, Fall picnic barbecue, or a candlelight steak dinner? No matter the occasion, we can work with you to tailor the experience to your desires! Call us or email with your requests, questions, and to make a reservation! Read more about holding a conference or retreat at the Vee Bar! 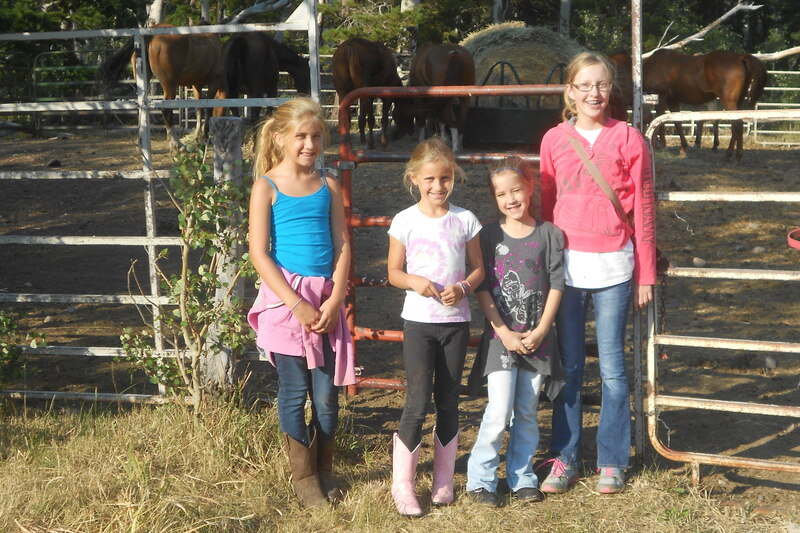 Read about a family reunion at a dude ranch! Dude horses are varied in their level of training, breeds, and confirmation. The best quality for our dude horses to have is a mellow disposition and the willingness to adjust weekly to having a new (mostly beginner) rider on their back. Guests come to the ranch ready to enjoy their vacation for a variety of reasons, but usually it’s the attraction to horses and ranch life that is their initial draw. Families come hoping that there is something for everyone, that everyone has a safe horse experience, and maybe for a little thrill-seeking. Dude horses at the Vee Bar have a unique set of criteria to make it as a guest horse. Not all ranches offer loping horseback rides, but we do at the Vee Bar. It takes a GREAT horse to be able to lope safely in a group with a guest on their back who knows how to do minimal speed control and steering. One quality that we look for in horses that we purchase is what the horse-world calls a “soft eye” and a level head. In other words, if a horse is walking around, nearly prancing, with its head high in the air it will have a tendency to be excitable and antsy. A horse with a soft eye is one that is very inviting to human presence and is usually calmer to be with on the ground, which also means they are more even tempered when a rider is on their back. Age is of some importance. A horse that is too young lacks life experiences that come with being a trail horse. Even though it may be very broke and quite reliable, it is not really proven until it has been exposed to “scary things” on the trail. Good examples might be coming up on a pack-donkey in the mountains when it has otherwise never been exposed to a donkey. When the donkey has a huge monstrosity on its back, it may look like a monster to the horse. The horse will have a choice of reactions: get away as quick as possible, or trust his rider to steer him past it, even if it is with caution. Horses are usually mature around 7 or 8 years old, some older, some younger. By then you will probably be able to predict (somewhat) how that horse will react to certain situations. I mentioned confirmation as a quality that we do not shop for, but that is only half true. Certain confirmation traits come with certain breeds. Sometimes we need to shop for horses with a lot of muscle to make sure it is strong. A horse that is wider across the chest, “thick-boned,” and has good feet will sometimes experience fewer injuries than a finer-boned, tall, lanky horse. Horses with good straight legs and appropriately proportioned bodies are also important. There is a lot to the confirmation category, so let’s just say that we don’t shop for confirmation to have good-for-breeding bloodlines, but rather shop for traits that are practical for our uses! A Quick Ride Can Tell a Lot! In most cases we ride horses before we purchase them. When riding them there is a lot you can tell about their manners. Horses that are trained to rein and stop easily are a must. And, if they show signs of being too stubborn to leave their barn or friends, they are going to be at least that stubborn when they come home. We also do not want horses that need an hour of riding before they are calm enough for a guest to be on their back. We want to be able to saddle them, get on them immediately, and begin a nice calm ride. There are a lot of horses that are not like this and need some exercise before they are ready to behave themselves and pay attention to their rider. Even though you would like to take all horse-sellers at their word, it is not always possible. For one thing, even if they tell the truth, many horse-sellers have never seen their horse react to someone who has never ridden before. Some horses immediately take advantage of a beginner rider while others stick to their training. And, only WE know our ranch operation and what will be asked of the horses. 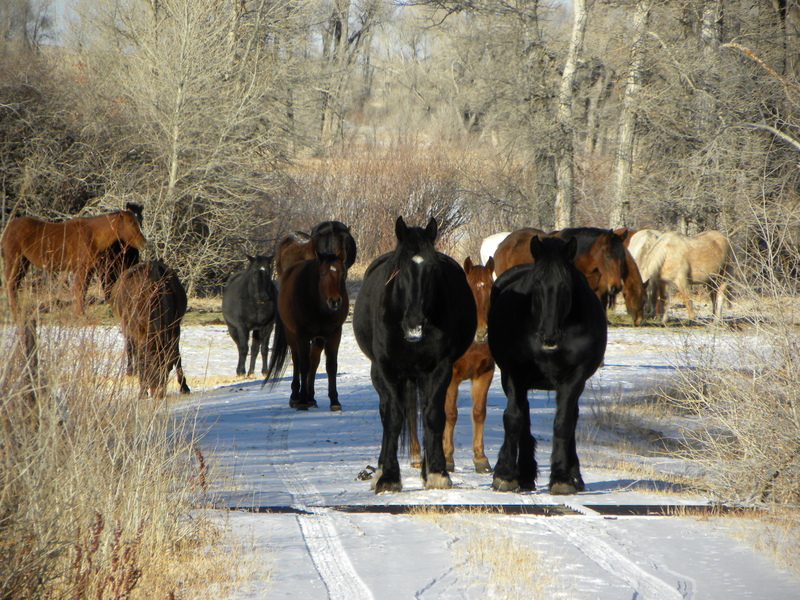 When the new horses arrive at the ranch, they are usually kept in the corrals close to the barn for a couple days. This is to keep an eye on them to make sure that they do not come with a disease that will infect the rest of our herd. It also gives them a couple days to settle down in their new surroundings, learn where “home” is, and allows us to introduce them to the herd when the time is right. Then the riding begins, and that is when we start to learn about the horses that we have purchased, and expose them to all things Vee Bar! We take them on rides in the meadows and see how they react to seeing our trails for the first time, how they handle water crossings, and if they easily and calmly walk, trot, and lope. We do not put guests on them until we feel VERY comfortable with them and feel like we know them well. If we do not know the horse well, it is harder to tell a guest how to ride it when all we have to go on is the body-language that the horses is exhibiting. The Vee Bar takes great pride in its’ horse herd. It may not come as a surprise to hear that there are quite a few horses that we purchase that never become guest horses. We hold our horses to high standards. After a period of time, if we feel that the horse will not ever become a dude horse, we will resell the horse to someone that we feel will benefit from it. The Vee Bar horses are often under-appreciated, but they could arguably be the most valuable ranch asset!! Less than 100 years ago, America relied heavily on horses for transportation and work. With the invention and widespread use of cars and tractors, the need for horses greatly diminished. Now, farms and ranches that use draft horses for work are rarely found, and the hobby is described as a lost art. However, there is still a nostalgic feeling that most of us get when we see a strong team of sturdy horses pulling a wagon, or decked out in their flashy harness. 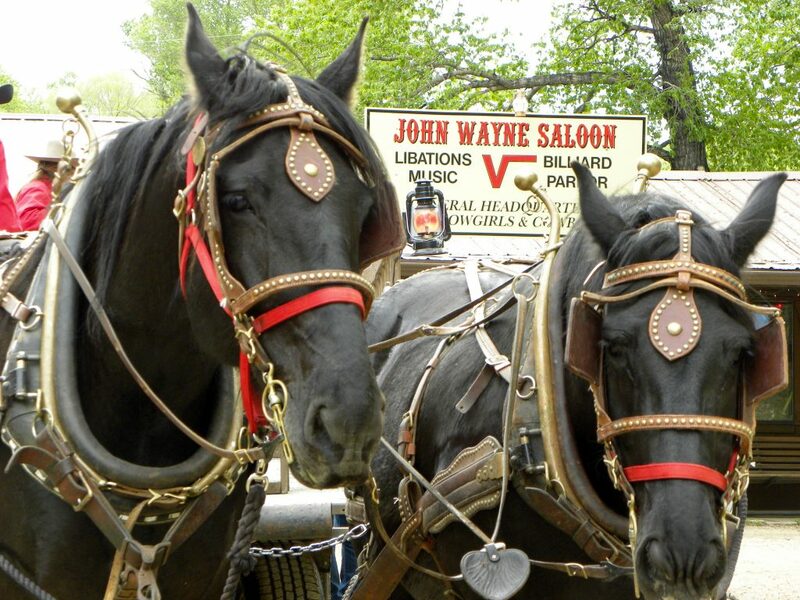 You can imagine when the Vee Bar wranglers catch two huge Percherons, harness them up, and hook them onto a wagon, guests are quite awed by the… well, awesomeness… of the team! The Vee Bar Percherons tower over the other horses in the corral, and they are not hard to spot, because of their pure black color, and their sheer size. These big dudes go by the names Goliath and Decker. No, their names don’t go together like most team horses do, like Butch and Sunny, or Daisy and May, or Sampson and Goliath, or Black and Decker. These guys don’t have matching names because their story is somewhat unique. We purchased Goliath with his partner Sampson when they were 3 and 4 years old. Brent and Kari put a lot of time and work into making them a great team, and they were young enough that they needed regular work. Kari and Brent took them to Colorado when they lived there in order to work with them consistently through the winter. Both horses, but especially Goliath, would lunge into the harness when he was first hooked to the wagon so the start was a bit rough! They did not like to stand still while they were hooked onto something either. Kari and Brent hooked Sampson and Goliath to every piece of farm equipment that was available—plows, wagons, drags, and more! The horses would work up a good sweat and then Kari and Brent would make them stand… and stand… and stand. Eventually they came to appreciate standing more. By the following summer, Sampson and Goliath and Kari and Brent were a great match. However, in his free time Sampson was a regular Houdini and eventually, he got himself into a mess he could not get out of, and Kari and Brent could not help. The search was on for a new team, or a new partner for Goliath. Sometimes it is quite difficult to pair two horses together and expect them to be a team, unless they have worked together since a young age. Goliath ended up getting matched with two or three more partners. Although they pulled okay together, they were certainly not friends and they did not socialize in the same “circles” when they were turned out. (Yes, horses do that!) To complicate matters, Goliath had two abscesses two summers in a row. We decided that it was time to get a new team, so we purchased a very gentle team, Black and Decker. Black was older than Decker but both were very nice, middle-aged horses, which now matched Goliath’s age. We wasted no time hooking them up, and getting to know them once we had them at the ranch. Black ended up with a condition that was treated by an equine chiropractor. The condition caused dis-coordination in his legs which made it unsafe for him to be hooked to a wagon. One day, out of urgent necessity, we decided that we needed to use Goliath and Decker together and try to make them a permanent team. It was quickly apparent that Goliath had finally found his new team mate, who was also his friend. These guys have been paired together for three years now and they get along, both while hitched to equipment and out in the meadows! So, that’s the story about how Goliath and Decker came to be! 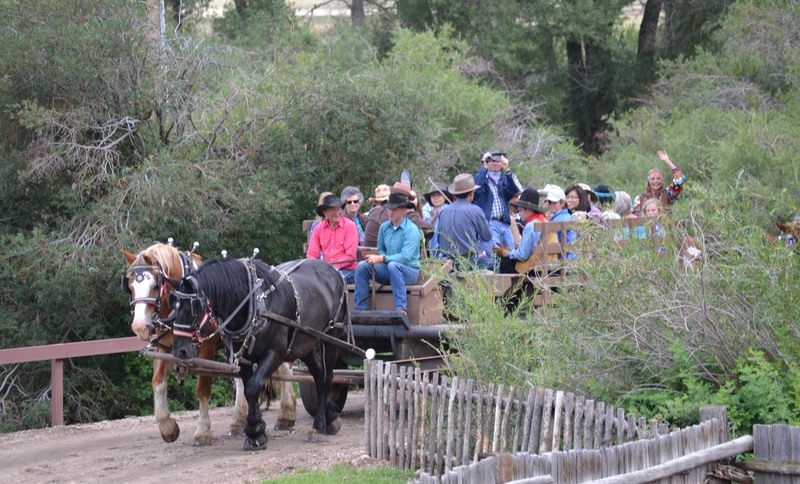 The Vee Bar offers wagon rides weekly as part of the summer guest ranch package. To learn more about wagon rides the rest of the year, view information here. Send us your best Vee Bar Guest Ranch video for our first video contest! A winning video will be selected in each of the following categories: Kids Say It Best, Life’s Special Moments, Laughter is the Best Medicine, and People’s Choice. The winners will receive a $200 credit to use towards a stay at the Vee Bar. The winning video will be added to our Vee Bar You Tube Channel and will be featured in our newsletter, Hoofprints! It is likely that video submissions will fit in more than one category, so it will be judged in the category that we determine to be the most fitting. The top five videos (across any/all categories) will be selected to be judged for the People’s Choice Award. Videos must be in .mov or .mp4 format when they are submitted. Videos must be no longer than 3 minutes in length. The videos nominated for People’s Choice will be selected by mid-October, then voting will go live to determine the winner. The People’s Choice winner will be announced in November. Videos do not need to be filmed at the Vee Bar, but they need to be about the Vee Bar. 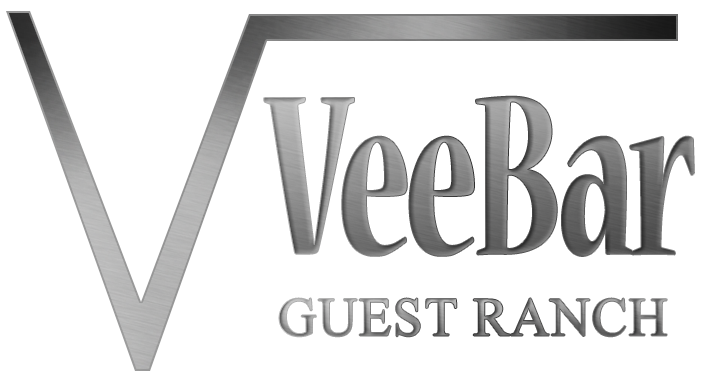 There is no cash value for the $200 voucher; it must be used towards lodging at the Vee Bar. The voucher can’t be used towards merchandise. One video entry per household is allowed. Submit your videos to the contest by September 15, 2017! Stay tuned to see the selected winning videos! To get the New Year started on the right foot, I thought I would give you a sneak peek preview of a huge project that we have been working on over the last couple months! The riverside suites were due for some new bedding, and in some cases, new décor, and new curtains. 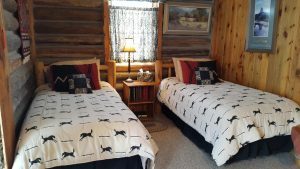 After doing quite a lot of shopping around, we found a selection of bedding from different suppliers that conformed with our country/cabin theme. We put that together with custom-made curtains, pillow cases, and local artists’ works and we have very satisfactory results! Here are some photos from one riverside suite, taken from my phone a couple days ago. A Queen bed in a riverside suite; new bedding and pillows on this bed! Each suite has a sitting area; this antique couch has been reupholstered, along with the pillows! There is a bedroom with two twin beds in every suite. There are new plush comforters under the bedspreads on many beds now! Each suite bathroom has a washer and dryer! All bathrooms have new tile on the floor and new cove heaters, and rugs in front of the sinks! Many other updates have occurred to the Vee Bar’s accommodations in the last year. 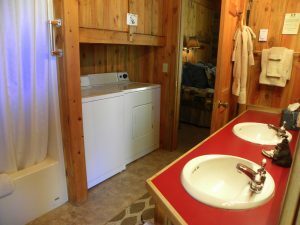 In the riverside suites, guests will find new cove heaters in the bathrooms, new carpet in half of the units, new gas stoves in some units, new bathroom floors, new screen doors on the larger cabins, and more. The next stage of this project is to get some great photos to share with you on our website and unfortunately, that is still a work in progress! The Vee Bar Guest Ranch takes great pride in our property, accommodations, and services. We always strive for the very best! Come see for yourself! Contact us to check availability, whether you are looking for a quick weekend getaway or a horseback riding vacation! We look forward to hearing from you! Adventure! Fun is on the menu at the Vee Bar Guest Ranch! With an array of activities to do, the adventurous spirit can take hold! Not only are there a lot of activities (and new ones each season), there are activities that many guests have never done before. 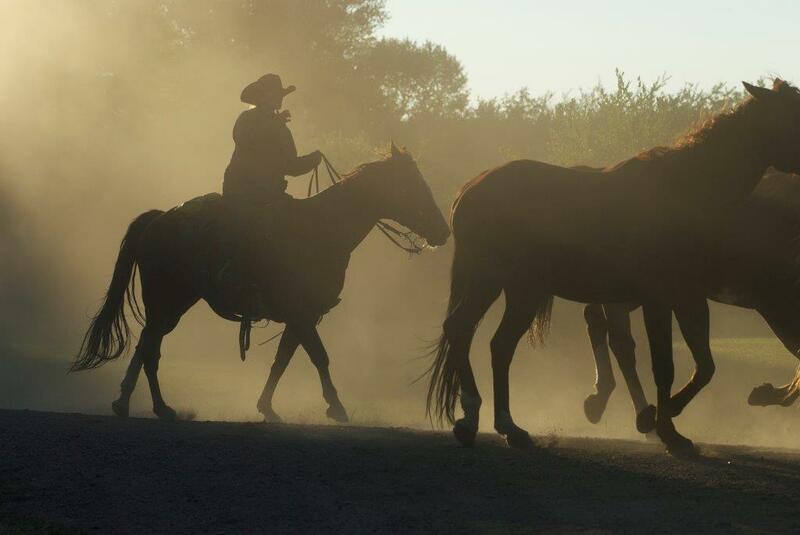 Whether it is horseback riding, trap shooting, or roping, guests are sure to experience something new and different. Whether it’s the thrill of having some risk involved, or the concentration it takes to try something technical (swinging a rope is not as easy as it looks!) that arouses your adventurous side, you can do it at the Vee Bar. And, when was the last time you tried something new? 15% discount if you sign up by July 7! The Vee Bar Guest Ranch is excited to announce the first annual Stoecklein Photography Workshop at the ranch September 23-26, 2016. 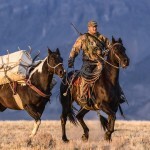 Drew and Taylor Stoecklein are famous western photographers and experts in their field. 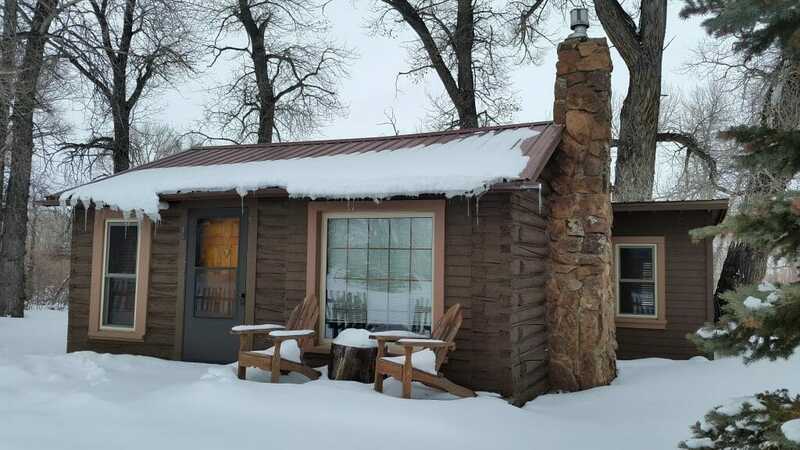 The Vee Bar Guest Ranch is the perfect western location, with the Little Laramie River weaving its way through the property and the Snowy Range Mountains as the backdrop. 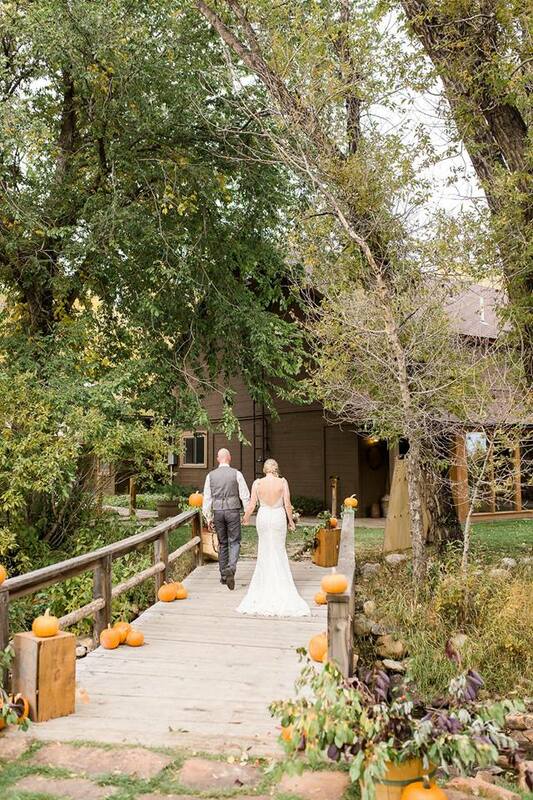 Together the Vee Bar Guest Ranch and Stoecklein Photography are offering the best of the best! 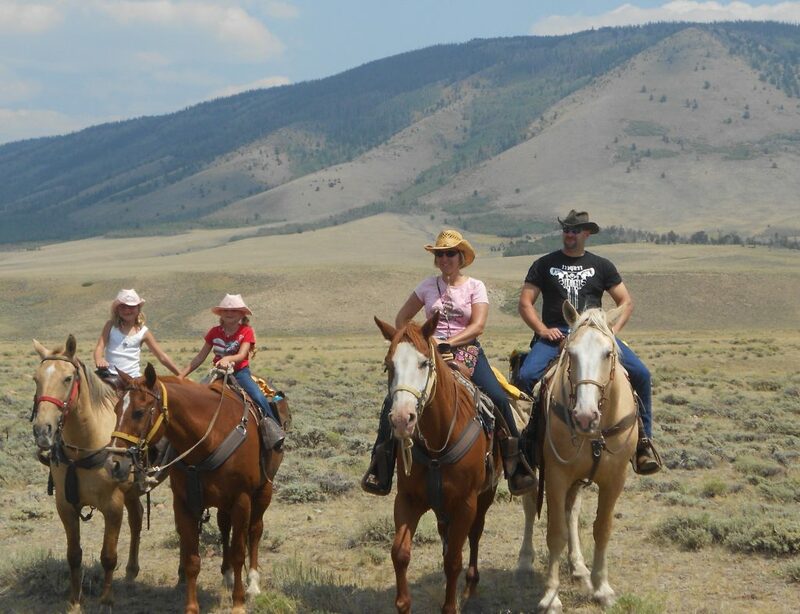 The Vee Bar Guest Ranch, located in southeast Wyoming, 20 miles west of Laramie, Wyoming, is a family-owned summer guest ranch and a winter bed and breakfast. The historic main lodge was built in 1891 as a stage coach stop. Now, there are a total of nine guest cabins in addition to rooms in the main lodge. 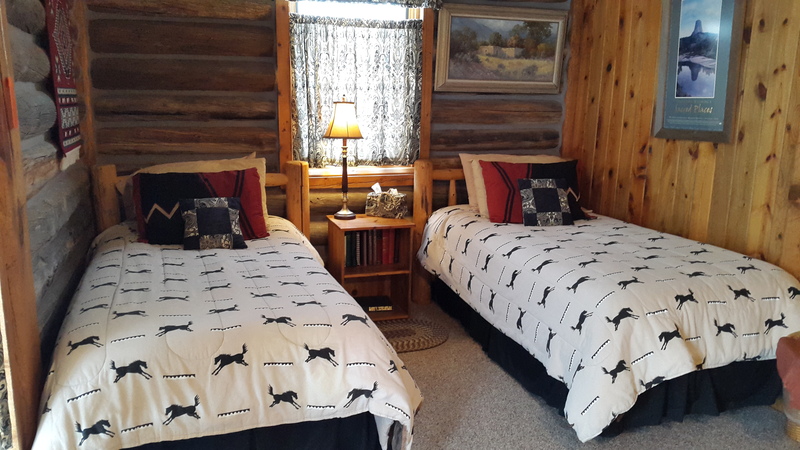 Charming cabins with modern amenities provide guests with the comforts of home, and the babbling Little Laramie River waters provide the perfect nighttime lullaby. The main lodge serves as the dining room where guests enjoy delicious home-cooked meals. The John Wayne Saloon is a fully stocked bar with a pool table, board games, and cards. 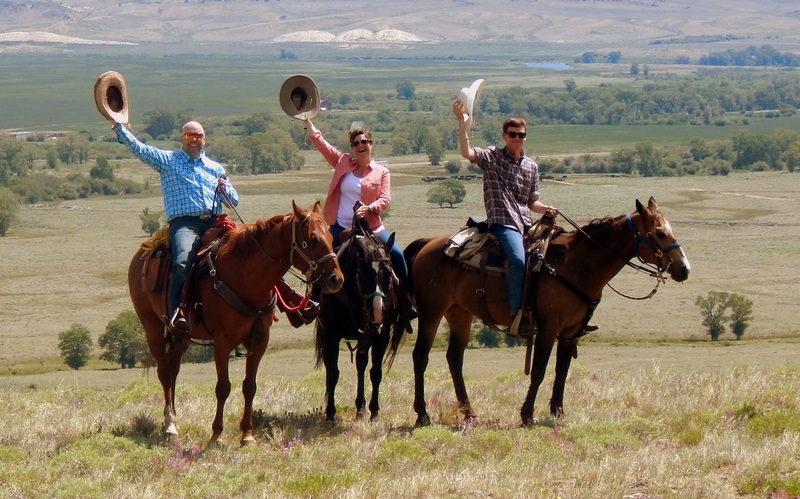 Guests enjoy other activities and amenities on the ranch including an outdoor hot tub, horseshoe pits, archery, trapshooting, horseback riding, fishing, and other seasonal activities. Stoecklein Photography students will gain inspiration from Drew and Taylor Stoecklein to capture real-life cowboys and cowgirls in an authentic western setting. 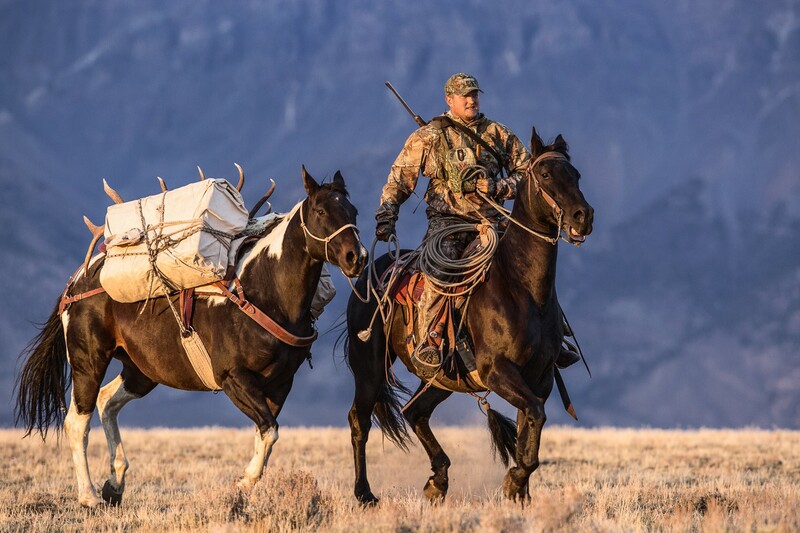 David Stoecklein’s fascination with the ranching heritage of the West led him to befriend, and subsequently photograph, the men and women still breathing life into the mythical figure of the cowboy. David’s passion for preserving the traditions and beliefs of the country’s honest, hard-working cowboys and cowgirls gradually earned him their respect. With that respect came an open invitation to share in their lives, and the great responsibility to honor their trust. David has materialized the Spirit of the West for generations to come. He has preserved millions of images, produced many books, calendars, prints and cards. Now David’s sons, Drew and Taylor are proud to continue to share their father’s legacy. Drew Stoecklein chose a path that has led him around the globe on assignments for commercial and editorial clients, both as a cinematographer/photographer and as a sponsored athlete. Spending time behind the lens and also in front of the camera has given him a valuable perspective for capturing unique and eye-catching images. Drew’s first book, Seasons of the Steelhead, produced in 2011, received the coveted Best Book of the Year Award from the American Fly Fishing Trade Association. Drew’s biggest thrill is delivering unforgettable imagery to all of his clients. To learn more and sign up for the first annual Stoecklein Photography Workshop at the Vee Bar Guest Ranch, click here! Whether you are looking for a romantic getaway or an adventure-filled family vacation, the Vee Bar Guest Ranch has it all! The ranch’s location is ideal for outdoor enthusiasts. With the Snowy Range Mountains at the doorstep, guests often take advantage of marked trails for hiking, snowshoeing, and cross country skiing. During the summer months guests can also mountain bike and fish mountain lakes and streams. In the winter, families travel to this area of the Snowy Range Mountains for downhill skiing at the Snowy Range Ski Area and snowmobiling on some of North America’s best trail systems. The Vee Bar Guest Ranch is often used as a base for such activities. At the end of a day full of fresh, crisp air, guests can relax in front of the wood-burning fireplace in the main lodge or soak in the outdoor hot tub. Guests commonly dine at the ranch in the evenings. Dinners are served off a menu on Friday and Saturday nights and buffet menus are served other nights of the week. Chef Dale has been cooking at the Vee Bar for almost seven years, and he will make sure you don’t leave hungry! 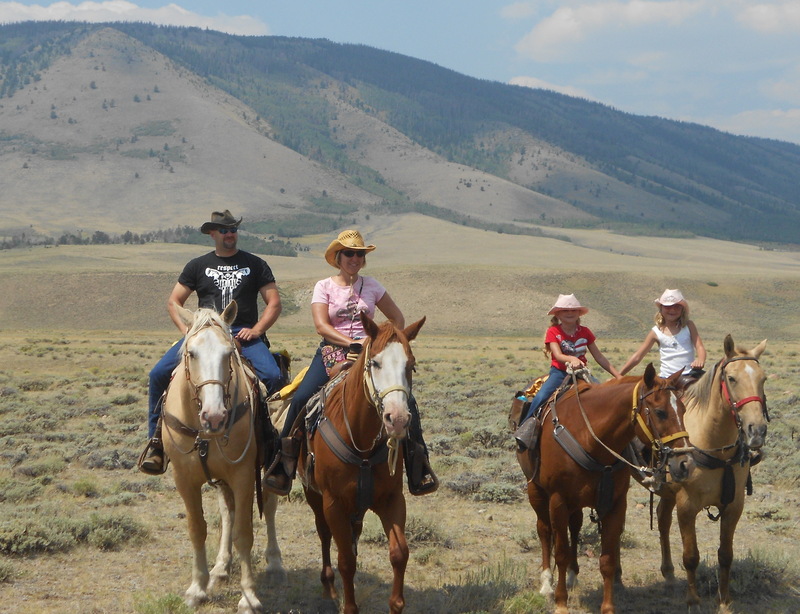 During the summer guest ranch season, June–August, guests purchase an all-inclusive package. Although horseback riding is the main activity, there is plenty to do if you are not sure about riding! A six night package is the most common length of stay, and if guests are looking for some action-packed fun they will find it here! With that said, it should be mentioned that guests can do as much or as little as they like! There is something for everybody! 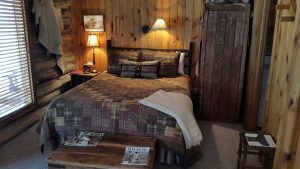 So, whether you are looking for a cozy cabin in the foothills or a summer vacation destination, the Vee Bar Guest Ranch has it! And, it’s waiting for you!